Have you ever seen one of these bumper stickers? The “Smile, Jesus loves you” part is found on lots of stuff, including bouncy-balls, CD holders, key chains, etc. This one, I found to be particularly notable… I feel like I’m being chosen for the army… it hardly makes me want to smile. 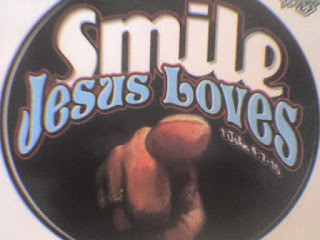 What kind of message does this convey—“Smile, Jesus Loves You”? There’s this twisted philosophy out there, that Christians should be happy all the time or at least look that way. It’s as if you’re supposed to suppress any real emotion and cover it with a smile because you’re a Christian and if a Christian looks sad, maybe it’ll cause an observer to not want to be one—it might scare them away. But I think it’s this sort of philosophy that scares people away, people are not impressed by fake displays of illusion emotions. People are attracted to authenticity. Yes, Christians should celebrate but we should also mourn and get angry about things. Emotions are from God and showing them is authenticity. We should be masters of authenticity because we know that God doesn’t demand that we have it all together. So sure, smile, but only if it’s real. Cry if you need to cry, get angry if there’s something worthy of your anger, you don’t need to be happy all the time. Remember that Jesus wept. Be real and learn authenticity and authentic celebration.